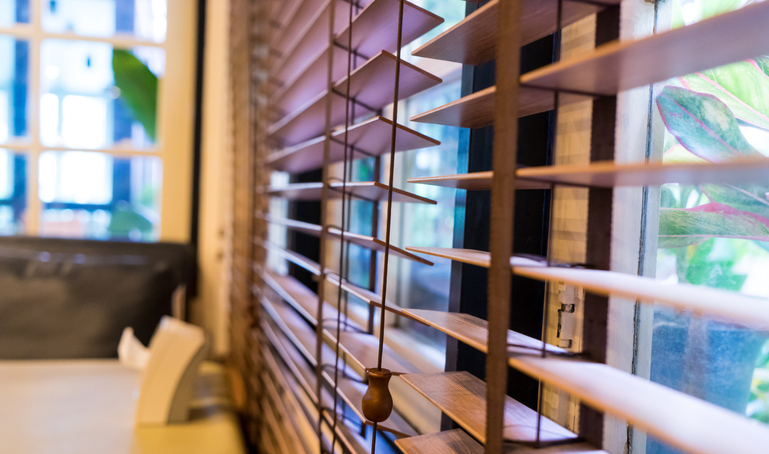 A slat is a long, narrow strip of wood, metal, or the like used as a support for a bed, or the horizontal strips Venetian blinds have, for example. Colloquially, in US English, always in the plural form, slats are ribs. The verb to slat means to fit with slats. Unrelatedly, as a nautical term, to slat means ‘to flap violently’ as sails do on boats. We laid the mattress over the slats of the bed. Tony dusted the slats on the blinds. Olivia prodded Vinnie in the slats. The carpenter slatted the bed frame. The sails were slatting in the wind. Now archaic except in some dialects, slat was once used to mean “slate,” either in the sense of a roofing slate or a writing slate. Slat dates back to the late 14th century. The Middle English noun sclat or slatt (a roofing slate or thin, flat stone) came into English from the Middle and Old French esclat (splinter, chip or split piece), from the verb esclater (to break, splinter or burst). Its origin is uncertain, but it is likely that it came into French from the Frankish slaitan (to tear or slit) or a similar Germanic source. Slat is related to the French éclat (splinter or shard), the Old Saxon slitan, the Old Frisian slita, the Old Norse slita, the Middle Low German and Middle Dutch sliten, the Dutch slijten, the Old High German slizan and the German schleißen (all meaning ‘to slit’), as well as the Old English slitan (slit) and, of course, the Modern English slit and slate. The sense ‘a long, thin, narrow piece of wood or metal’ dates back to the mid-18th century.